It’s 2019—and Snapchat still has about 188 million active daily users. But it’s also still dwarfed by Instagram—which has 500 million daily users—and probably always will be. And that begs the question: why should your business invest in capturing attention and building an audience on Snapchat, the demonstrably less popular platform? As of 2018, about 45 percent of Snapchat users are 18 – 24 years old and 71 percent are under 34 years old. 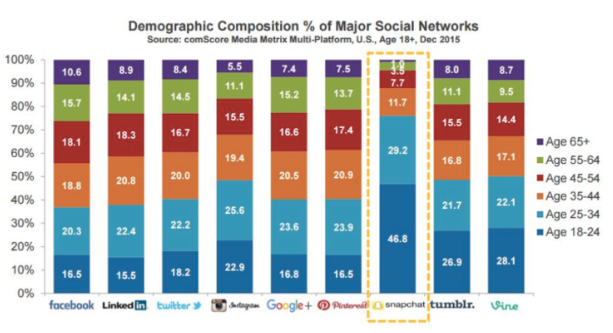 That means Snapchat is still extremely popular among Millennials. So if your goal is to engage a younger demographic, Snapchat can be a potent source of engagement. Also, Snapchat users create 3 billion videos a day, spending an average of 30 minutes on the platform. Those numbers—coupled with Snapchat’s impressive audience targeting capabilities—suggest big opportunities for brands and marketers. Don’t have a Snapchat for Business account? If you choose to advertise on Snapchat, you’ll need a business account. If you don’t have an account, create one here. Then fill in your business details. Like most actions on Snapchat, creating a business account is simple and intuitive. Once your business is established, you’ll be prompted to create a campaign. Of course, this is optional. As a business, you don’t need to advertise on the platform to garner attention, build an audience, and make an impact. Yes, allocating spend to your content will improve its reach. That said, there are other strategies you can use to optimize your marketing on Snapchat. These are time-tested, proven tactics and principles social media marketers can apply to grow virtually any brand. If you’re new to Snapchat, be sure to read our beginner’s guide. It will help you learn the technical skills necessary to apply these strategies. But if you already know the fundamentals, stay put. You’re in the right place. These tips will help you make the most of your presence. As a marketer, your audience is everything. But your audience is not everyone. Your audience is a group of people who all share the same want. And, maybe, they all share a unique blend of characteristics. For example, your audience may live in a specific location; your audience may speak a specific language; your audience may make a specific income. The better you understand these characteristics, the better you’ll be at creating good copy and art that captures attention, incites interest, creates desire, and compels action. 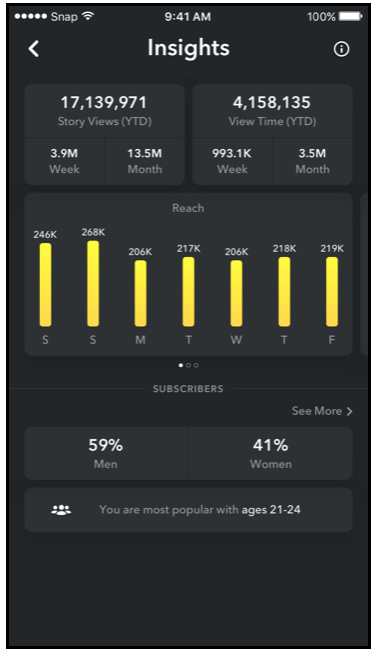 In addition to showing your unique views, view times, and completion rates, Snapchat Insights can tell you your content’s fall-off rate and screenshot count. These statistics can only help you better understand what your audience wants. You’re using Snapchat. But are you finding success? Maybe. Maybe not. You wouldn’t be able to tell if your content investment is worth the resources unless you set clear goals. Good social media marketers always set goals for themselves. But the best social media marketers set S.M.A.R.T. goals: specific, measurable, attainable, relevant, timely goals. For example, if you want to use Snapchat to grow your mailing list, it doesn’t make sense to create objectives around screenshot counts. Instead, it makes more sense to focus on driving followers to your website, where they can sign up for your newsletter. The latter is far more relevant and applicable to your business goals. The S.M.A.R.T. goal framework will keep you honest and focused as you create marketing objectives. If you want to know where you’re excelling and where you’re falling short, study your competitors. The best way to identify a competitor is by analyzing your audience. Who else is your audience following? Do any of those brands resemble your own? Those that do are vying for your prospects’ attention. But not every competing brand is worth analyzing. Start by creating a long list, then pare it down. Choose three or four strong competitors to benchmark yourself against. Are your competitors active on every social network? Or only a couple? How many people are following your competitors? And how quickly is each following growing? How often do your competitors post? How many likes, retweets, shares, and comments do your competitors’ average? Now it’s time to analyze this raw data. Analyze to understand what your competitors are doing well on Snapchat? Are their posts timely or interesting or clever? What strategies can you borrow? Analyze where your competitors are falling short. Is their cadence slow or inconsistent? Are their posts to self-serving? What can you avoid? Given your competitors’ strengths and weaknesses, where can you differentiate yourself? For example, if there’s no humor in the landscape, can you insert some? Anything that can go wrong, will go wrong. Identify these instances and be prepared for them. And you don’t need to do all of this manually. There are tools you can use to make the process easier, faster, and more effective. More specifically, share great Snapchat Stories. A Story is a video or photo that lives in Snapchat for 24 hours, then disappears. But creating content—great content—is hard. It’s hard to capture attention, create intrigue, and compel people to keep watching. The best Snapchat Stories are typical yet surprising. That is, they follow a standard narrative arc: rising action, climax, falling action, resolution. But they’re also unexpected, delivering humor or suspense or educational value. In any case, viewers should walk away from your Story pleasantly surprised, delighted even. To create this effect, many businesses create “behind-the-scenes” Stories, providing content followers would otherwise never see. You can also ask questions, create polls, and conduct interviews to engage audiences. Whatever content you choose to create, remember to keep it light and, of course, authentic. Snapchat users appreciate authenticity. It’s the reason many started using the platform in the first place. File size. Maximum 5MB image and 32 MB video. File format. Image .jpg or .png. Video: .mp4, .mov, and H.264 encoded). Full screen canvas. 1080 x 1920 px. 9:16 aspect ratio. Snapchat doesn’t have “Suggested User” lists like Instagram, which makes it harder to build an audience. That’s why it’s important to make your Snapchat account as discoverable as possible. As a business, be sure to promote your presence using your handle and Snapchat icons that link back to snapchat.com/add/yourusername. You could also use your unique, scannable Snapcode. 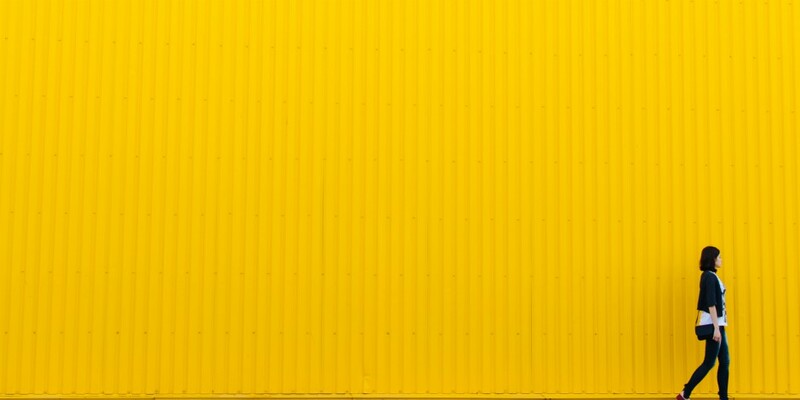 Your Snapchat icon should go in your website’s header, footer, and sidebar. It should also be present on your “Contact” page. Conventional wisdom says that the second most read part of an email—after the subject line—is the signature. That’s because 1) most people will immediately scroll to the bottom of an email to see who wrote it and 2) it visually stands out on the page. This means your email signature is extremely visible, which makes it the perfect place to display your Snapchat icon. Again, your Snapchat icon should go in the header or footer of your newsletter. It should be visible and prominent. This includes digital and print ads. If your goal is to amass as many Snapchat followers as possible, don’t be shy. Display your Snapcode everywhere. If you attend trade shows or conferences, make sure your Snapcode is somewhere accessible, where visitors can see and scan it (e.g., shoulder-height on your booth). It’s also important to post consistently and at the right time. Snapchat users check-in about 20 times per day, averaging about 30 minutes per day on the platform. Use Snapchat Insights to figure out when your audience is most active, then post regularly at that time. Need to grow even faster? Consider Snapchat ads. There are a lot of Snapchat hacks out there, little tricks and features that can make a big difference if you use them properly and consistently. This will help you draw the way you would with a stylus. For example, the “0” creates a nice oval border and the “A” will give you a bold triangular border. This is a great way to capture attention—and keep it. Nice! You captured a great shot… except for that one, little thing. That’s what the Magic Eraser is for. The tool isn’t perfect, of course. But it works exceptionally well on plain, simple backgrounds with solid colors. This is fun. More importantly, it captures attention. These are 5 essential hacks. Here are 30 more. Use Snapchat analytics to measure your results and, in turn, prove your return on investment (ROI). Snapchat analytics will help you understand your audience, learn what content performs best, and discover key engagement times. The better you know this information, the easier it’ll be to gain a competitive edge in the market. Step 1. Open Snapchat. Tap the icon to open it. Step 2. Go to your home screen. Tap your bitmoji in the top-left corner. This is the total number of people who opened the first video or image on your Snapchat story and viewed it for at least one second. You can see your unique views per week, month, and year. This is the total number of minutes your viewers watched your Snapchat story. Similar to Unique Views, you can see your View Time by week, month, or year to gauge the success of your content over that period of time. Studying this data will help you understand 1) which day of the week is best for you to post on and 2) how long your story should be. This is how many viewers watched the entire story from beginning to end. You can see this information broken down by day—and you can use it to analyze how well your content is resonating with your audience. This will tell you exactly when viewers stopped watching your story. It’s an incredibly powerful insight that will help you identify content that isn’t working and replace it. This is a breakdown of the percentage of men and women who watched your story. You’ll also find the age range of your viewers. You can use this information to understand the age, interests, and locations of your audience, all of which can inform the type of content you share. Want more neat Snapchat hacks, tricks, and features? Check out our post on Snapchat hacks, tricks, and features you probably didn’t know about. If your audience isn’t growing as quickly as you want (or need), Snapchat ads will help you acquire followers at a faster clip. This is a full-screen, vertical video ad that lasts 10 seconds or less. You can use it to funnel people to your website, to install an app, or just to watch a branding video. This is an ad type that lets users modify their images—usually selfies—with your branded filters and logos. Users do this because it’s fun. And when they share, your brand gets exposure. It’s a win-win. Approximately 1 billion Sponsored Snapchat Geofilters are viewed every day, so the potential for exposure is incredible. This is the cheapest, easiest, fastest way to get started with Snapchat advertising. It’s like a Sponsored Geofilter, but can be used in an ultra-tight area, like a city block. You can create one in a minute—and pay as little as 5 dollars to push it live. It’s an excellent option for small businesses. Snapchat is a simple, easy-to-use platform. But there are many nuances to advertising on the platform. Be sure to master the Snapchat advertising fundamentals before diving in.